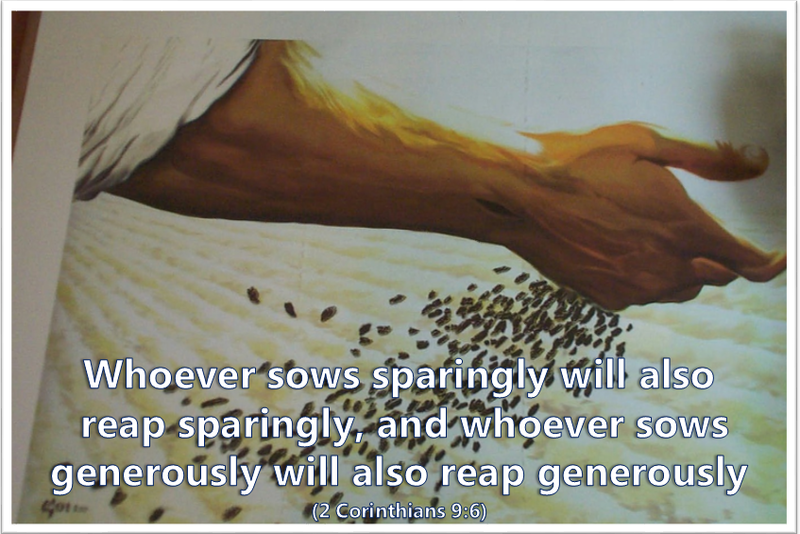 We are sowing all the time. At every moment and in every situation we are distributing something into our contexts and into the lives of others. It flows from our expressions, our words, our attitudes, our actions and our reactions. There is not one of us, whether introvert or extrovert, of whom this is not true. As we realise this we come to see also that we have a choice with regard to what is sown. It can be positive or negative, helpful or unhelpful, encouraging or discouraging, up building or degrading. We also have a choice as to how much we sow – minute quantities, sparingly or lavishly – and whether we so do willingly or unwillingly. Years ago as I walked past the public Library gardens on my way to work I often met a man walking across my path. He was a fairly large man with a round and generally smiling face and, as he walked, he sang out loud in a resonating bass voice. I did not understand the words which were not in English but the song, and the beaming joy with which it was sung, was a wonderful blessing bringing smiles to the faces of almost everyone who met him. What a gift it was! We all have within us the ability and the wherewithal to sow some blessing and encouragement into the lives of those around us. In a world in which the focus is turning increasingly inwards all it takes is the decision to be aware of others and – even for a day – to decide to seek ways of giving a blessing rather than looking for one ourselves. The wonderful thing is that so often sowing kindness brings it back again in some way – even in an immediate smile on the face of the recipient. Cultivate the habit of sowing love, light and life in your situation. It can change lives – including your own. Look – listen to the expressions of others – do something. Lord Jesus You blessed the lives of so many people. Help me to do the same and to be excited about it. Amen. Categories: Christianity, Daily Life, God | Tags: Corinthians, Daily Bread, Faith, Grace, Jesus, Life, Love, Scripture | Permalink.